In Part 3 of this video series, we have seen how to create tables (tblPerson and tblGender) and enforce primary and foreign key constraints. Please watch Part 3, before continuing with this session. In this video, we will learn adding a Default Constraint. A column default can be specified using Default constraint. The default constraint is used to insert a default value into a column. The default value will be added to all new records, if no other value is specified, including NULL. The following command will add a default constraint, DF_tblPerson_GenderId. The insert statement below does not provide a value for GenderId column, so the default of 1 will be inserted for this record. On the other hand, the following insert statement will insert NULL, instead of using the default. is it possible to change the default value for exisintg default constraint if yes please explain.. Yes, we can by altering the constraint. Column 'GenderId' in table 'tblPerson' is invalid for creating a default constraint. What if we delete the default value 3 from tblGender and rule of referential integrity-set default is set for the foreign key in tblPerson ? The database integrity will be lost . so it doesn't allow u to delete that default value 3 in the tblGender .. the error will be raised .. IF we are adding multiple records to the table, without providing a value for GenderID, will it be adding 1 for all the fields? If so, since GenderID is a primary key, it has to be a unique value, so how does this work? 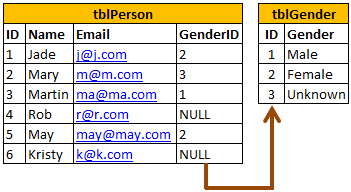 Gender ID is primary key in tblGender table, where as value you are inserting in tblPerson table. No,Restrictions .Depending on your requirement what u want u can..